Edison Cook III was only 25 when he decided it was time to fulfill his dreams of entrepreneurship. The former college baseball player had developed a taste for Which Wich while working the front desk at the Driskill Hotel in Austin, Texas. So, he decided to bring the franchise to Orange, Calif., the home of his alma mater. Here's what he has learned. 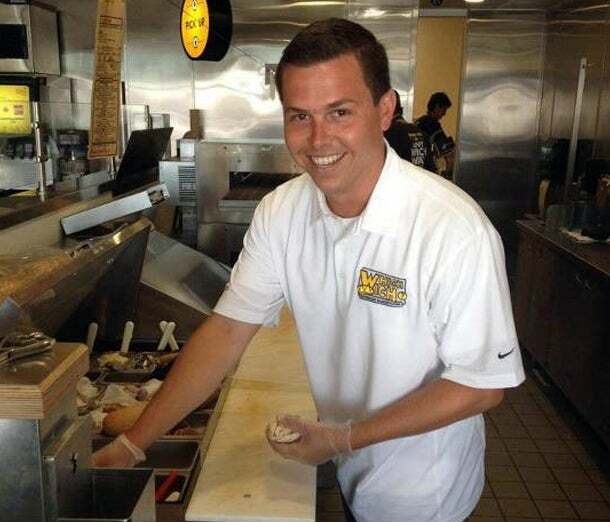 I opened my first Which Wich location in Orange, Calif., near my alma mater’s campus in 2012. Since then I have opened two more locations. I studied business entrepreneurship and have always wanted to own my own business, particularly in the food industry. I didn’t feel I had the experience required to open a full-scale restaurant. Franchising allowed me to own my business while having the support of an established team at the corporate level. I attended Chapman University in Orange, Calif. where I studied business entrepreneurship and played baseball. After pitching for three years, I left the team my senior year to start a moving company with my roommate. After college I moved to Austin, Texas and began working at the front desk in the historic Driskill Hotel. I worked my way up to concierge supervisor, but when I turned 25 I decided it was time to fulfill my dream of owning my own business. I was a frequent customer of Which Wich in Austin. The menu allowed for endless sandwich possibilities. When I looked into purchasing my own franchise, I was drawn to Which Wich’s unique concept; it felt newer and fresher than other chains like Subway. I saw huge growth potential with the brand and loved the trendy vibe. Because of the menu structure, Which Wich is ideal for gaining repeat customers. I spent around $375,000 to get my first location up and running. We took over a space that had been a Quizno’s and completely gutted and renovated the space. I knew about Which Wich from being a customer. I researched a couple of brands before deciding which franchise to purchase. I spoke with multiple franchisees from each brand about their experience, the workload and the return on their investment. After flying to Dallas to meet with Chief Vibe Officer Jeff Sinelli, I was impressed with the growth potential I saw with the brand. The biggest challenge was adapting to running a business on my own once the corporate team had left after training. Making sure I had the right team in place after the corporate training staff had left was a challenge for me. My best piece of advice would be to look at the business objectively at first. You never want to be a part of a brand that you don’t believe in, but it’s important to initially look at each opportunity as a business investment and try not to get too emotional in your decision making. You want to set yourself up for success. When I looked at other franchises I liked the food, but no cuisine seemed as timeless and consistent as a sandwich. What did you take from your experience playing baseball that you’ve applied to your career? I learned so much from my time as a college athlete. The main thing baseball taught me is how to work on and with a team. In baseball, you have to be proactive about your strategy and planning both in the long term and short term and I think that has applied to my business as well. I am able to handle pressure, adapt and solve problems on the fly, and I have been known to use baseball analogies when training my staff. I now have three Which Wich locations throughout Southern California and am actively looking for a fourth location in south Orange County. My goal is to eventually have ten Which Wich locations throughout Southern California.